very little care. Its cost of production is also low because its requirements for fertilizer, irrigation and plant protection are not much. Further its nutritive value is very high. Therefore, it is and ideal fruit for the nutritional security. Guava is also grown as a backyard fruit to great extent. In India, the best quality guavas are produced in Uttar Pradesh, particularly in Allahabad region. Owing to its hardy nature, guava is grown successfully in tropical and subtropical regions up to 1, 500 m above mean sea-level. Best quality guavas are obtained where low night temperatures (10`C) prevail during winter season. It tolerates high temperatures and drought conditions in North India during summers but it is susceptible to severe frost as it can kill the young plants. An annual rainfall of about 100 cm is sufficient during the rainy season (July- September). The rains during harvesting period, however, deteriorate the quality of fruits. Guava is cultivated on varied types of soils- heavy clay to very light sandy soils. Nevertheless, very good quality guavas are produced in river-basins. It tolerates a soil pH of 4.5- 8.2. Maximum concentration of its feeding roots is available up to 25 cm soil depth. Thus the top soil should be quite rich to provide enough nutrients for accelerating new growth which bears fruits. Also known as Sardar, its fruits are large, roundish ovate in shape, skin primrose yellow and pulp white, very sweet and tasty. The TSS and vitamin C contents are high. The trees are vigorous. The most famous variety of Allahabad, it has acquired large variations due to seed propagation. The fruits are large in size, round in shape, skin smooth and yellowish white. The flesh is white, firm, soft having pleasant flavour, high TSS and vitamin C content. The seeds are numerous, bold and hard. The trees are tall with profuse branching and broad crown. It can withstand drought conditions. The variety is very popular in western Uttar Pradesh. The fruits are characterized by numerous red dots on the skin, high sweetness, and small and soft seeds. It is otherwise similar to Allahabad safeda fruits in size, shape and pulp. It has higher TSS content than Allahabad Safeda and Lucknow 49 but lower vitamin C content. The tree characters resemble to those of Allahabad Safeda. Harijha is more popular in Bihar because of profuse bearing. The trees are of medium vigour due to sparse branching. The fruit is round in shape, medium large in size and greenish yellow in color. Flavour is sweet with good keeping quality. 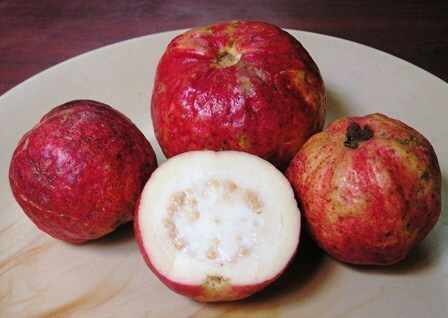 It is a red- fleshed guava having good taste. It is mainly grown in Bihar. Fruit is of moderately big sized, spherical in shape with thin skin. Trees are of medium vigour but productive. Its fruits are medium sized and pink colored. They are sweet in taste with good keeping quality. They require low temperature for the development of good pink color. The trees are of medium vigour but their leaves are greener than others. However, it is a moderate yielder. All the seedless varieties viz. Saharanpur Seedless, Nagpur seedless and others, are the same. Two types of fruits, completely seedless and partly seeded, are borne on a plant of seedless variety. The completely seedless fruits develop on the shoots rising from the stem and these are bigger in size and irregular in shape. The partly seeded fruits are born on normal shoots at the periphery and are small in size and round in shape. Seedless variety is unfit for commercial cultivation because it gives very low yield. The plants are very vigorous. This is a seedling selection of variety Allahabad Safeda. Its medium sized fruits are of excellent quality with high TSS. The white pulp has only few soft seeds. The plants are of medium vigour but high yielding. Allahabad Surkha is an outstanding variety of large, uniform pink fruits with deep pink flesh. The plants produce up to 120 kg fruits in its sixth year of fruiting. The fruit is sweet, strongly flavoured with few seeds and is slightly depressed at both ends. The plants are vigorous, dome shaped and compact. Guava is propagated both by seeds and vegetatively. But vegetative propagation is followed commercially. The propagation of guava through seeds should not be encouraged because the seedlings have long juvenile phase, give lower yields and bear poor quality fruits. But the seedlings serve as rootstock material for grafting or budding. The seeds should be sown as soon as possible after extraction from the ripe fruits. Soaking of seeds in water for 12 hours or in hydrochloric acid for 3 minutes gives about 90% germination. About 1 year old seedlings become ready for grafting or budding. For planting seedlings, seed should be collected from the plants producing high quality fruits and high yield. In northern India, guava is propagated by inarching, giving a very high percentage of success during rainy season. But inarching is cumbersome and gives limited number of plants from the mother plant. Budding has been adopted only on a limited scale in some parts of the country where the atmospheric humidity is high. The main problem encountered in this method is disbudding of rootstock making it labor intensive. Among the various methods of budding- shield, forkert, patch, and chip – the patch budding is a ideal giving highest percentage of success. However, the best time of budding differs from locality –to –locality. Layering is being commercially followed in the southern and western India with very good results. After bending the plant, its branches are covered with soil leaving the terminal portion open. In a few months the rooting of branches takes place which are then separated from the mother plants and planted in the nursery for further sale. Layering is a labor intensive method. A limited number of plants can only be multiplied from a mother plant. When mother plants are very tall, air layering of shoots is done during the rainy season using polythene and moist sphagnum moss. Use of root promoting plant growth regulator, IBA (3,000 ppm), promotes the rooting of air layers up to 100%. The main limitation of air layering is the poor establishment of air layering in the nursery after detachment from the mother plant. Further, the method is very cumbersome and labor- intensive. Base of each shoot rubbing the cambium of the exposed portion in May. All the shoots are mounded with the soil to a height of 30 cm. the soil is covered with mulch to conserve the moisture. After a period of 2 months of the onset monsoon, the shoots are detached from the mother plant at ringed portion and planted in the nursery. The shoots are headed back to maintain the root and shoot balance before planting in the nursery. A semi dwarfing rootstock for guava aneuploid 82 has been developed. The filed for planting is prepared during summer season by ploughing, leveling and removing weeds. The pits of 1m x1m x 1m size are dug and filled with a mixture of farmyard manure and soil. If soil is good and irrigation facilities are available, the preparation of land and digging of pits are not required. The planting is done during the rainy season by adopting square planting system. 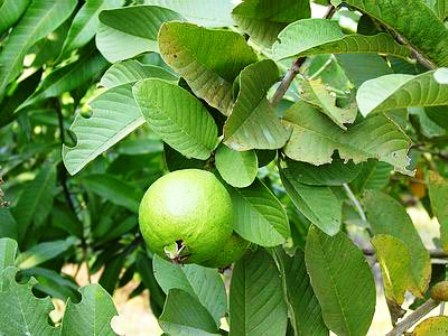 Guava is commercially planted at a distance of 5-8 m. The exact planting distance is, however, decided according to variety, soil fertility and availability of irrigation facilities. Guava Lunknow 49 needs more spacing than apple guava and Allahabad Safeda. Under irrigation and high soil fertility, the plants become very vigorous requiring more spacing. In normal conditions, a planting distance of 7 m is optimum. High density planting reduces total soluble solids, sugars and ascorbic acid but increase irritable acidity. The lower plant population results in the spread of crown, while higher planting density causes erect growth of branches making the plant tall and compact. High density planting gives higher yield/ unit area in early years of fruiting. Traditionally, no pruning is done in guava because the plant bears heavily even without it. But no pruning results in the formation of narrow crotches, limb breakage due to heavy fruit load and overcrowding. Therefore, training of plants in young stage to build strong framework and to avoid weak crotches is necessary, whereas fruiting trees should be trained as low headed trees to facilitate multiple hand pickings. The open centre of delayed open centre system may be adopted. The scaffold branches in young plants are to be tipped back to encourage secondary branching the root sucker, water sprouts and criss-cross branches are to be removed altogether. In Maharashtra, bending of horizontal branches is practiced to some extent by tying the branches of 2 adjoining plants to increase fruiting in young plants but it is labour intensive and creates hindrances in cultural operations. In every growing season, a large number of new shoots emerge on a guava tree and majority of these are lateral. Very few are terminal. These shoots produce fruits. After 1 year most of the lateral shoots dry out, while terminal shoots put forth the extension growth. Hence, to check the overcrowding and to control the plant height, the terminal shoots on the periphery may be headed back at about 40 cm level in alternate years. Pruning also takes place during harvesting as the fruit is plucked along with the shoot on which it is borne. Pruning is usually recommended after harvesting or in spring. Summer pruning may damage the plant by sun burning. Although guava is grown without the application of any manure and fertilizer, it responds very well to their application by giving higher yield and better quality fruits. For guava growing regions of the country, different fertilizer schedule- 600 g N, 400 g K in northern region; 260 g N, and 260 g K in eastern region; 900 g N, 600 g P and 600 g K in southern region and 600 g N, 300 g P and 300 g K/plant/year in western region, have been recommended. The fertilizer application should be based on leaf nutrient status of an orchard, wherever feasible. Time of fertilizer application depends on the crop taken and the region. In north India, fertilizer is given in the first week of May for rainy season crop and in first week of July for winter season crop. In West Bengal, fertilizers are applied in 2 equal split doses, one in January and the other August. At Bangalore, full K and 70%N are applied in June and full P and 30% N in September. Since 48% of feeder roots of guava are found in the surface soil up to 25 cm depth, the fertilizer should be placed in 25 cm trenches 1 m away from the trunk for better uptake. Sometimes guava suffers a deficiency which is characterized by reduction in leaf size, intervenal chlorosis, and suppression of growth and dieback of leaders. It can be corrected by spraying of ZnSO4 (0.45kg) and hydrated lime (0.32 kg) in water (33 liters). Bronzing is another common problem in guava. It is caused by the deficiency of B, Zn, N, P and K Due to low soil pH the soluble P level of leave is a better index for bronzing. Guava Lucknow 49 is more susceptible then Allahabad Safeda. It can be reduced by improving the soil pH and treating the soil with N, P, K and Zn at 200, 80, 150 and 80 g/ year respectively, or fortnightly foliar spraying of these nutrients each at 2% for 4 months. 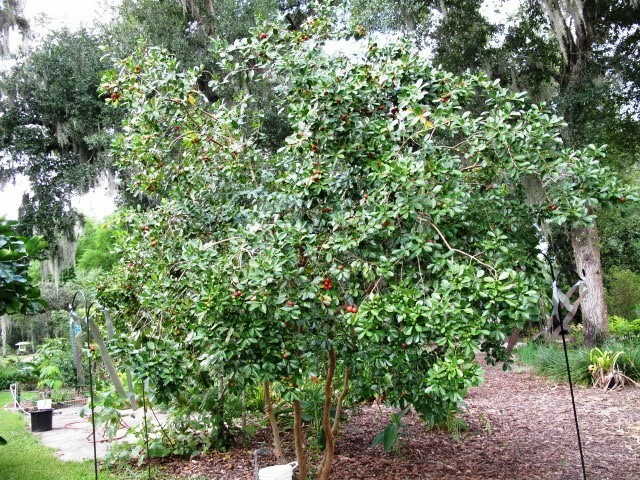 Guava plants do not require much care after planting. The weeds are removed by shallow cultivation. Green Manuring should be done during rainy season and clean cultivation during rest of the year. Leguminous crops can be grown as intercrops during first 3 year of planting to obtain more income and to increase the N content of the soil. Both rainy and winter season crops are very heavy compared with spring crop. Fruit quality of the winter crop is best. Therefore, winter crop is preferred over the rainy season crop. In northern India, normally hot and dry summers along with low soil moisture do not allow summer flowers to set the fruits for rainy season crop which is known for its poor quality fruits and severe incidence of fruit fly and fruit-borer. The practice of increasing winter crop and by removing rainy season crop is known as crop regulation. The rainy season crop can be removed by spraying of urea (10 %) on Allahabad Safeda and 20% on Lunknow 49 at the time of peak flowering in summer season. Other methods of removing rainy season crop are hand removal of flowers and fruits, spraying of bioregulators, root exposure, withholding irrigation and pruning of ¾th of flower-bearing shoots are either costlier or impractical or ineffective. Guava is mostly grown under rain fed condition and irrigation is rarely practiced wherever this facility is available. However, irrigation enhances the yield of guava by making the plant more vigorous and increasing the fruit set. Irrigation is especially desirable after planting for survival of the plants and thereafter for 2-3 year to obtain early good growth. Irrigation of fruiting plants depends upon the adoption of a particular cropping pattern. For the whole year, cropping pattern which is commercially adopted all over the country except the northern region, irrigation is essential during summer season. Normally, winter season cropping pattern is adopted in north India which requires fortnightly irrigation during October-November. Irrigation is given to make the soil of root zone moist; thus heavy irrigation is unnecessary. The fruit quality of guava is adversely affected by high soil moisture content during harvesting. Guavas are harvested throughout the year (except during May and June) in one or the other region of India. However, peak harvesting periods in north India are August for rainy season crop, November-December for winter season crop and March- April for spring season crop. In the mild climatic conditions of the other parts of the country, the peak harvesting periods are not so distinct. Guava fruits develop best flavour and aroma only when they ripen on tree. In most of the commercial varieties, the stage of fruit ripeness is indicated by the color development which is usually yellow. For local market, fully yellow but firm fruits are harvested, whereas half yellow should be picked for distant markets. The fruits are harvested selectively by hand along with the stalk and leaves. The plants begin bearing at an early age of 2-3 years but they attain full bearing capacity at the age of 8-10 years. The yield of a plant depends on its age, cropping pattern and the cultural practices. A 10 year-old plant yields about 100kg of fruits every year. If both rainy and winter season crops are taken, more yields may be obtained in the rainy season. Ripening of guava starts on the tree and continues even after harvest. It is accelerated in rainy season due to high temperature and slows down in winter season due to low temperature. The fruits are packed in baskets make from locally available plant material. For distant markets, wooden or corrugated fiberboard boxes are used along with good cushioning materials- paddy straw, dry grass, guava leaves or rough paper. Good ventilation is necessary to check build up of heat. Guava is a delicate fruit requiring careful handling during harvesting and transporting. The fruits should reach the consumer in a firm condition. Because of their perishable nature, guava as disposed off immediately after harvesting in the local market and a very small quantity is sent to distant markets. Since fruits are sold at a cheaper price and are available for a very long period of the year, they are not kept in cold storage. However, shelf life of guava can be extended up to 20 days by keeping them at low temperature of 5 C and 75-85 % relative humidity. It can also be stored for about 10 days at room temperature (18`-23`C) in polybags providing a ventilation of 0.25 %. Guava plants are attacked by wilt, which alone causes heavy losses. It is very difficult to find out an orchard of guava more than 30 years in age because most of its plants die at about 20 years of age due to wilt. Various fungi causing wilt are Fusarium roseum oxysporum, F. psiddi, F, solani, Macrophomina phaseolina and Gliocladium roseum. Resistant rootstock is the only solution. The planting material should not be obtained from a wilt infected region or nursery.